Do You Log Your Miles? I've always been *pretty good* about logging my miles. I can't seem to remember from week to week what I've run. So it helps me to keep track to make sure that I'm not ramping up the miles too fast etc. Also, I like to look back and see my pace and to be able to compare. Anyway, so yeah, I have always logged my miles. This year, I'm doing something a little different. I'm also keeping a paper log. But in addition to this log, I also use DailyMile. I know I know. It might seem redundant, but with an online log I can share it with social media. And I have used it for years. And I can quickly go back and see past data. It's also been a great motivator to me to log in and see what others are doing. I remember the times that I didn't necessarily feel like getting my run in, but I would see others logging their miles on DailyMile and it motivated me to get my rear in gear and log some miles. And today, I just received an email that there is a new App for DailyMile you can download it here https://itunes.apple.com/us/app/dailymile/id931615804?ls=1&mt=8. So far I like it. Since I'm not approved to walk today, I can't check out the GPS function, but I do like the interface. And I can quickly scan and see previous mileage for the week. Also, there are more options to like and comment on others posts. If you are on DailyMile, I'd love to add you as a friend. And if you haven't checked it out, yet, I'd encourage you to do so. I usually log my miles but don't think too much about it. I never really started running until about 16 months ago, and I just know that I am doing a lot better now (usually 5 miles a day!) compared to back then, when I would usually only run 1-2 at most. Like you said though, I think logging your miles can be super important for motivation and keeping you going on your journey. Awesome job on your running! I've never logged my miles but my son and daughter-in-law do. They are serious joggers and join in every walk and hike they can find to help raise money for different organizations. I'll have to tell them about the The Complete Runner's Day-By-Day Log as this is something I think they will be interested in. No, I have never logged my miles. Although I really should do that! I need to get back to running and walking. I love taking walks or run/jog in the summer. It's been below zero here lately, so it's hard to get out and go for a walk or run. I do have a treadmill though, so that would help! I will definitely check out the log, thanks! Yeah, I decided this year since I"m injured to log my walks also and count that into my yearly mileage. I have a treadmill also. It's a love/hate relationship. I'm going to try REALLY hard to keep track of my mileage this year! 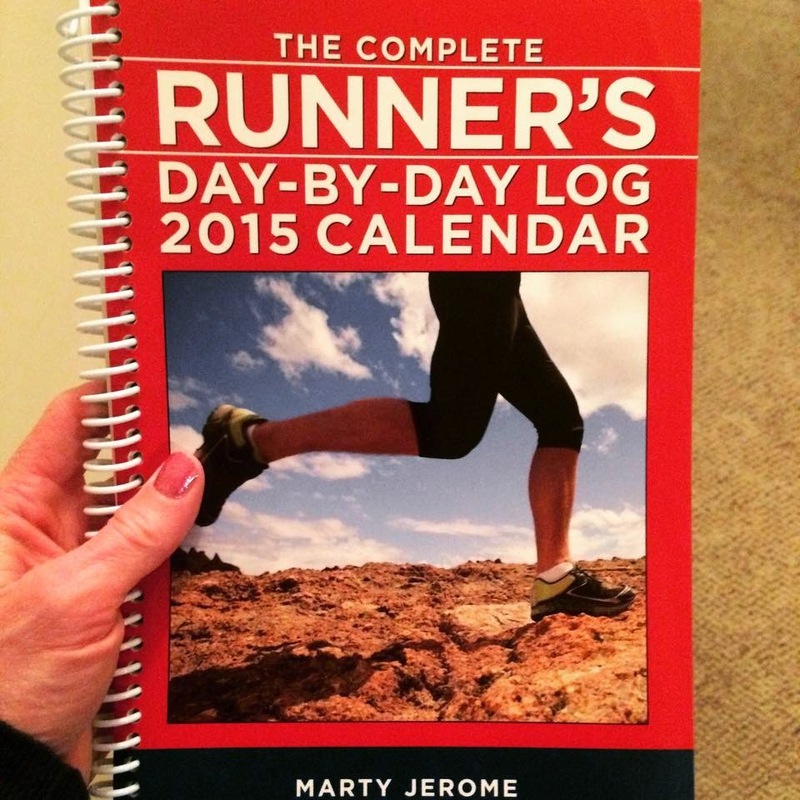 My husband and son bought me the same running log that you have! I use RunKeeper to log my miles. I love daily mile but the no app thing wasn't cutting. Glad to see they launched an app. Will check it. Thanks for the heads up and happy running to you. Yep, I just got an email about it and downloaded it today! Happy running to you also. I thought this year just seemed like the year to really try to keep up with my walking/running miles. I decided to include walking this year since I'm injured. This looks like a neat calendar/journal. I'm just getting into running. Good luck with your running. It's an awesome journey! I use my Garmin to log my miles (garmin connect) and I also log them on Daily Mile, so they can fall onto my blog. Yeah, I think we are following each other on DailyMile? Have you tried the new app? I use daily mile and a paper calender but I'm pretty inconsistent with it. I've been seeing so many really cute running logs lately I kind of want one. Yeah, I'm hoping I will continue to log and not forget! Today I made sure to write it down as soon as I finished my walk. I don’t run much. I need to. This year if I am able to get myself on track and working out I will definitely be logging my miles. I love coming by your blog as you are my motivation to get myself into gear. Thank you for the compliment. :) And good luck with your goal of working out this year. Just keep doing it and it will become a habit and like second nature. I don't log my miles because I don't run. If I did though I would definitely keep my log in a notebook. I know everything has gone digital these days but I much prefer having something actually in front of me to write in or read for future reference. Happy running! Sometimes digital has hiccups So I enjoy the paper version also. Okay so the first step would be to RUN....hahaha. I tried to do a Couch to 5K program and didn't get very far, but it was fun at least. I still have the app on my phone. I do like that this is a paper version since I think people reach their goals easier and more efficiently when they can SEE it on paper. I think digital reminders and to dos get lost in the hustle and bustle of the everyday person. I track my miles on a calendar and then keep the previous year's calendar to compare. What a great little journal to keep with you. I am with Krystal on this one.. haha I am not a runner but I always wanted to be one. With 2015 my resolution is to become more active and this journal can definitely be my first step towards that. I love how organized everything is, it makes it so much easier to keep track of progress.